Designed for extreme-shaped, hard-to-fit guitars such as V's and Explorer styles. The 300-VXR Universal Extreme Case fits most oversized and extreme shaped electric guitars and some basses, such as the Thunderbird. Constructed of solidified multi-ply laminated wood and features Coffin's trademark red velvet diamond-tuck quilted interior with a "shock-resistant" velvet pillow to keep your axe comfortably at rest. A large neck compartment with reinforced wood cross bracing holds your valuable accessories, five black secure steel latches with lock and key and a durable black PVC exterior make this case road ready. 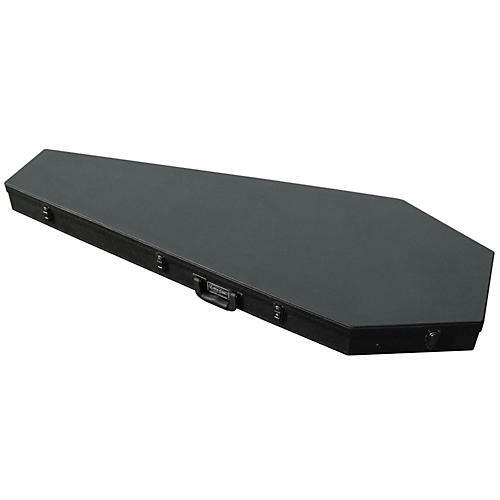 Interior dimensions of the 300-VXR Coffin Case are: 59" x 22" x 3". Protect your special axe with something out of the ordinary. Order today.